PLAYGROUP LEADER - There are no openings for this position at this time. Please check back later for future openings. We are open Monday-Friday. Holiday availability is a huge plus! We are looking for someone to work with open availibility. Reliable transportation (whether it be your own vehicle, public transportation, etc) is a must. A background check will be done on all qualified candidates. Positions start at $15.00/hour, and may be negotiable depending on experience. Perks include free daycare and training classes, discounted boarding and grooming for your pup, opportunities for education (including Certification through the Pet Care Services Association) and more! 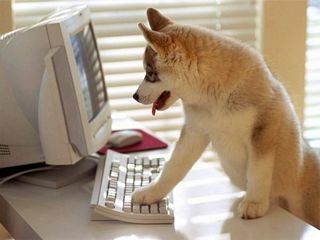 For consideration, please submit a cover letter with your resume (attention: Ashley) to pareservations@dogslife.biz. Make sure to include in your resume any relevant animal care experience and why you are a good fit for this job. In your cover letter please provide us with a daytime and evening phone where you can be reached (please indicate the best time to call you). To expedite the hiring process, please fill out our ON-LINE JOB APPLICATION. NO PHONE CALLS, please! LOBBY HOST - There are no openings for this position at this time. Please check back later for future openings. The Primary duties of the Lobby Host are checking in our daycare dogs, assisting customers with questions and requests, updating client files, as well as light housekeeping to keep our Lobby and Owner's Lounge looking clean and inviting! This position requires extensive use of computers. Candidates must have a solid foundation with MS Word and Excel, be proficient with email, and able to pick up our client tracking and database software quickly. Candidates must also have excellent phone skills and be able to multitask. Secondary duties of this position will be as a Playgroup Leader on our daycare floor, interacting with and ensuring the safety of our pups! You must be able to work as a team player in a fast paced and loud atmosphere that can be physically demanding. Playgroup Leaders are responsible for supervising and regulating all dog-dog play and helping to open and close the facility. Playgroup Leading shifts will most likely be available, as well. Experience with animals is not required, but is a big plus! Individuals must be able to function in a very fast paced, physical environment and lift up to 40-50 lbs. We see all sizes of dogs on a daily basis, so be prepared to be handling anything from a 5-pound Yorkshire Terrier to a 150-pound Great Dane! Reliable transportation (whether it be your own car, public transportation, a bike, etc) is a must, as well as a cell phone (with voice mail). A background check will be done on all qualified candidates. Positions start at $15/hour, and may be negotiable depending on experience. Perks include free daycare & boarding for your dog, discounted grooming for your pup, free training classes, opportunities for education and more! We have everything from Yorkshire Terriers to Great Danes, Chinese Crested to Standard Poodles, so you must be comfortable working with all breeds of dogs, and be able to do so with a gentle hand. 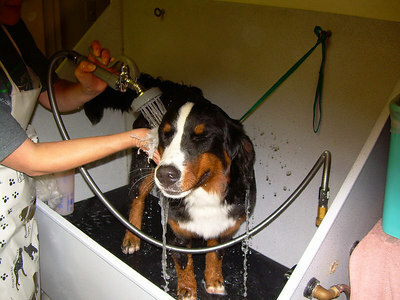 We are looking for a part-time groomer to work mornings at our Palo Alto facility. Reliable transportation (whether it be your own vehicle, public transportation, etc) is a must. A background check will be done on all qualified candidates. Perks include free daycare & boarding, free training classes, opportunities for education and more! For consideration, please submit a cover letter with your resume (attention: Keith Uchida) to keith@dogslife.biz. Make sure to include in your resume any relevant animal care experience and why you are a good fit for this job. In your cover letter please provide us with a daytime and evening phone where you can be reached (please indicate the best time to call you). To expedite the hiring process, please fill out our ON-LINE JOB APPLICATION. NO PHONE CALLS, please! 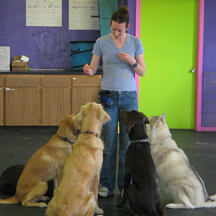 We are looking for a top-notch puppy and adult dog class trainer. Our organization works together to provide the community with positive, humane services that are both dog and people friendly. The training arm of our company provides puppy and adult dog classes, puppy socials, and specialty classes such as CGC, Multi-dog Household, Rally Obedience, Small Dog Manners, Tricks, Agility Skills for Dog Sports, etc. Position: This is a contractor position. You will be teaching level 1 and 2 Adult and level 1 and 2 Puppy classes. Curriculum and homework will be provided. Since curriculum is always evolving, we would like someone who enjoys working as a team with like-minded trainers to bring fresh new ideas to the table. When necessary, there may be opportunities to provide private training to class clients for ADL. What we want: We are looking for a trainer who embraces positive reinforcement training and someone who loves working with people as well as dogs. You must be available to teach weekend afternoons (Saturday and/or Sunday) at our Palo Alto and/or Sunnyvale locations. There may also be weeknight opportunities in the future. We'd like someone who can motivate owners to be excited about training their dogs and who can teach a fun, interesting and effective class. You will send pre-class emails, homework, and upcoming class info via email to the students. You will follow up with clients/staff via phone or email on any questions that may arise with clients. You will want to enthusiastically help in promoting your classes because you will be compensated based on how many students you have in your classes. positive-reinforcement dog training academy or school is a plus. Understanding of puppy development and ability to read puppy and adult dog body language required. You must be committed completely to positive reinforcement-based training methods. Ability and desire to engage your students (i.e., good customer service skills), and create a positive, energetic, friendly and supportive class environment is essential. You must be reliable and able to carry out duties and meet deadlines with minimal supervision. Teaching experience and private training experience required. What you get: A DOG'S LIFE provides support to our trainers by providing a large, clean and cleared classroom, class curriculum, homework, prizes for customers, giveaways, marketing support and "props" for classes. ADL provides registration service (on line, phone, email) and generates a roster for you for your classes. The ADL staff will work closely with you on any client questions or issues that arise. You will report to the Owner, who will support you to ensure your success and coordinate class schedules. ADL trainers are contractors who earn very competitive, percentage-based compensation.